CarD is a Myxococcus xanthus protein required for the activation of light- and starvation-inducible genes (PUBMED:8692912). This family includes the presumed N-terminal domain. 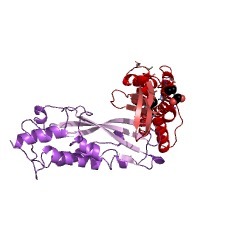 CarD interacts with the zinc-binding protein CarG, to form a complex that regulates multiple processes in Myxococcus xanthus (PUBMED:16879646). 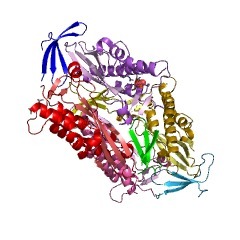 This family also includes a domain to the N-terminal side of the DEAD helicase of TRCF proteins. TRCF displaces RNA polymerase stalled at a lesion, binds to the damage recognition protein UvrA, and increases the template strand repair rate during transcription (PUBMED:7876261). 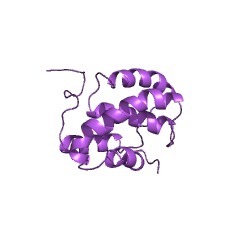 This domain is involved in binding to the stalled RNA polymerase (PUBMED:7876261). CarD is a Myxococcus xanthus protein required for the activation of light- and starvation-inducible genes [(PUBMED:8692912)]. This entry represents a domain found in the N terminus of CarD. 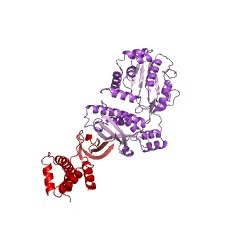 It is also found in transcription-repair-coupling factor (TRCF) proteins. There are 27067 CarD_TRCF domains in 27067 proteins in SMART's nrdb database. Taxonomic distribution of proteins containing CarD_TRCF domain. This tree includes only several representative species. The complete taxonomic breakdown of all proteins with CarD_TRCF domain is also avaliable. Click on the protein counts, or double click on taxonomic names to display all proteins containing CarD_TRCF domain in the selected taxonomic class. Recruitment of a novel zinc-bound transcriptional factor by a bacterialHMGA-type protein is required for regulating multiple processes inMyxococcus xanthus. 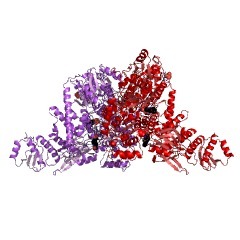 Enhanceosome assembly in eukaryotes often requires high mobility group A(HMGA) proteins. In prokaryotes, the only known transcriptional regulatorwith HMGA-like physical, structural and DNA-binding properties isMyxococcus xanthus CarD. Here, we report that every CarD-regulated processanalysed also requires the product of gene carG, located immediatelydownstream of and transcriptionally coupled to carD. CarG has thezinc-binding H/C-rich metallopeptidase motif found in archaemetzincins,but with Q replacing a catalytically essential E. CarG, a monomer, bindstwo zinc atoms, shows no apparent metallopeptidase activity, and itsstability in vivo absolutely requires the cysteines. 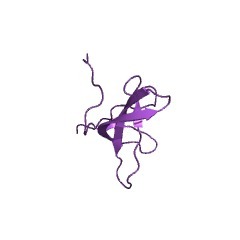 This indicates astrictly structural role for zinc-binding. In vivo CarG localizes to thenucleoid but only if CarD is also present. In vitro CarG shows noDNA-binding but physically interacts with CarD via its N-terminal and notHMGA domain. CarD and CarG thus work as a single, physically linked,transcriptional regulatory unit, and if one exists in a bacterium so doesthe other. Like zinc-associated eukaryotic transcriptional adaptors inenhanceosome assembly, CarG regulates by interacting not with DNA but withanother transcriptional factor. Domain architecture of a high mobility group A-type bacterialtranscriptional factor. Myxococcus xanthus transcriptional factor CarD participates incarotenogenesis and fruiting body formation. It is the only reportedprokaryotic protein having adjacent "AT-hook" DNA-binding and acidicregions characteristic of eukaryotic high mobility group A (HMGA)proteins. The latter are small, unstructured, nonhistone nuclear proteinsthat function as architectural factors to remodel DNA and chromatinstructure and modulate various DNA binding activities. We find CarD to bepredominantly dimeric with two stable domains: (a) an N-terminal domain ofdefined secondary and tertiary structure which is absent in eukaryoticHMGA proteins; (b) a C-terminal domain formed by the acidic and AT-hooksegments and lacking defined structure. CarD, like HMGA proteins, bindsspecifically to the minor-groove of AT-rich DNA present in twoappropriately spaced tracts. 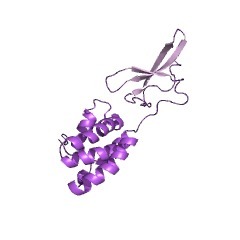 As in HMGA proteins, casein kinase II canphosphorylate the CarD acidic region, and this dramatically decreases theDNA binding affinity of CarD. The acidic region, in addition to modulatingDNA binding, confers structural stability to CarD. We discuss how thestructural and functional plasticity arising from domain organization inCarD could be linked to its role as a general transcriptional factor in M.xanthus. 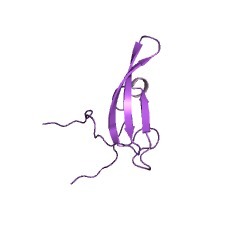 High mobility group I(Y)-like DNA-binding domains on a bacterialtranscription factor. The bacterium Myxococcus xanthus responds to blue light by producingcarotenoids. It also responds to starvation conditions by developingfruiting bodies, where the cells differentiate into myxospores. Eachresponse entails the transcriptional activation of a separate set ofgenes. However, a single gene, carD, is required for the activation ofboth light- and starvation-inducible genes. Gene carD has now beensequenced. Its predicted amino acid sequence includes four repeats of aDNA-binding domain present in mammalian high mobility group I(Y) proteinsand other nuclear proteins from animals and plants. Other peptidestretches on CarD also resemble functional domains typical of eukaryotictranscription factors, including a very acidic region and a leucinezipper. 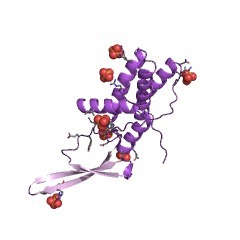 High mobility group yI(Y) proteins are known to bind the minorgroove of A+T-rich DNA. CarD binds in vitro an A+T-rich element that isrequired for the proper operation of a carD-dependent promoter in vivo. Structure and function of transcription-repair coupling factor. 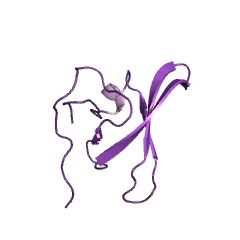 I.Structural domains and binding properties. The 130-kDa mfd gene product is required for coupling transcription torepair in Escherichia coli. Mfd displaces E. coli RNA polymerase (Pol)stalled at a lesion, binds to the damage recognition protein UvrA, andincreases the template strand repair rate during transcription. Here, theinteractions of Mfd (transcription-repair coupling factor, TRCF) with DNA,RNA Pol, and UvrA were investigated. TRCF bound nonspecifically to doublestranded DNA; binding to DNA produced alternating DNase I-protected and-hypersensitive regions, suggesting possible wrapping of the DNA aroundthe enzyme. Weaker binding to single stranded DNA and no binding to singlestranded RNA were observed. DNA binding required ATP, and hydrolysis ofATP promoted dissociation. Removal of a stalled RNA Pol also requires ATPhydrolysis. 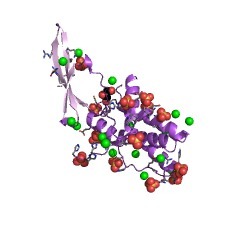 Apparently, TRCF recognizes a stalled elongation complex bydirectly interacting with RNA Pol, since binding to a synthetictranscription bubble was no stronger than binding to double stranded DNA,and binding to free RNA Pol holoenzyme and to initiation and elongationcomplexes in the absence of adenosine 5'-O-(thiotriphosphate) wereobserved. 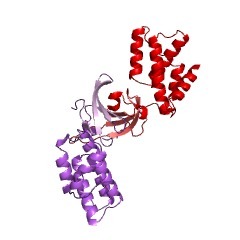 Structure-function analysis showed that residues 379-571 areinvolved in binding to a stalled RNAP. 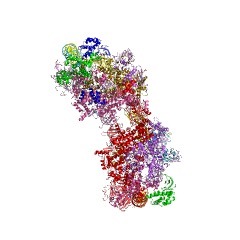 The helicase motifs region,residues 571-931, binds to ATP and duplex polynucleotide (DNA:DNA orDNA:RNA). Dissociation of the ternary complex upon hydrolysis of ATP alsorequires the carboxyl terminus of TRCF. Finally, residues 1-378 bind toUvrA and deliver the damage recognition component of the excision nucleaseto the lesion.